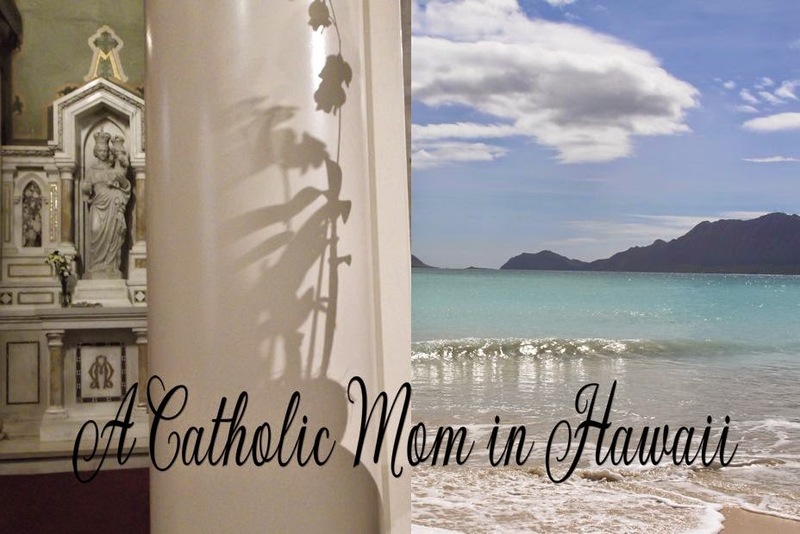 A big mahalo to Sunny of Faith and Country for sharing this. Picture source Joyce Images. Used by permission from Aida Yared. 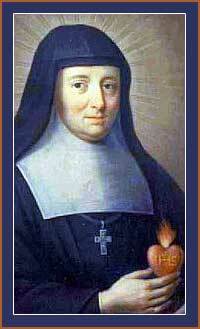 Saint Jeanne de Chantal (1572-1641) whose Feast Day we celebrate today. Thanks Sue. 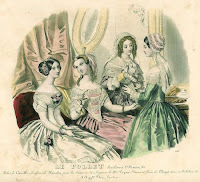 Margaret Mary has an excellent post about visitors to blogs. BTW, I must say that almost everyone who visits here have very good blog manners. 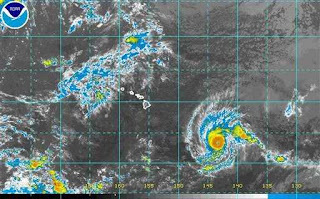 Mahalo to you for that! And, speaking of manners, I am curious about this and I'm directing this to other bloggers. I don't know about you but I get email requests all the time from folks who are looking for certain links, information, prayers, etc.. Even if I can't help them for whatever reason, I always respond. The curious thing is, that only a small percentage of those folks ever say thank you. Why? More than feeling slighted by this, I really am curious to know why. I know good manners are still important, are they not? Let us stand fast in what is right, and prepare our souls for trial. Let us wait upon God's strengthening aid and say to him: "O Lord, you have been our refuge in all generations. Saint Tarcisius, the boy martyr of the Holy Eucharist, is called the Patron Saint of First Communicants. It was to young Tarcisius that the Blessed Sacrament was entrusted to be carried, as inconspicuously as possible, as Holy Viaticum to imprisoned Christians who had been condemned to death. One day when Tarcisius refused to show them what he was carrying, a band of pagan Roman ruffians attacked him and beat him with sticks before stoning him to death. 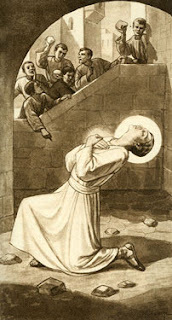 When his assailants turned over Tarcisius' body and searched him, they could find no trace of the Most Blessed Sacrament either in his hands or on his clothing–Christ had miraculously disappeared. Christians took up the body of the young martyr and buried it with great respect in the cemetery of Callistus. In the fourth century, Pope St. Damasus composed an epitaph for the young martyr's tomb which he had carefully restored and beautified. The epitaph leaves no doubt that belief in the Real Presence of Our Lord's Body and Blood in the Blessed Sacrament was the same then as it is now. "Christ's secret gifts by good Tarcisius borne, the mob profanely bade him to display; He rather gave his own limbs to be torn than Christ's celestial to mad dogs betray." My friend Denise of St. Elizabeth Ann Seton Exchange has posted a very good article by Father Thomas G. Morrow from which the following excerpts were taken: BTW, welcome back Denise! It is long but so well worth reading! "The Immaculate Mother of God, the ever-virgin Mary, having completed the course of her earthly life, was assumed body and soul into heaven." love, can enter into eternal life, which is God himself. If you have ever read the Diary of St. Faustina Kowalska you know that she was deeply in love with the Blessed Virgin Mary. There were so many ways that St. Faustina expressed her love for the Virgin Mary; through praying the rosary, celebrating Mary’s privileges, titles and liturgical feasts, through Marian novenas and Marian consecrations, and by other various forms of Marian devotion. One of the most interesting aspects of the Diary of St. Faustina is that she especially loved and wrote about the privileges of Mary’s Immaculate Conception and her Assumption. 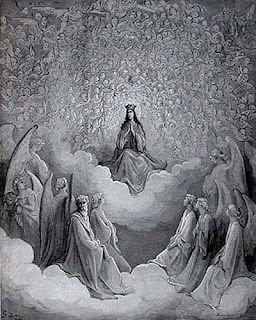 Concerning the Assumption, St. Faustina made four specific entries on the actual day of the Solemnity of the Assumption in the years 1934-1937. 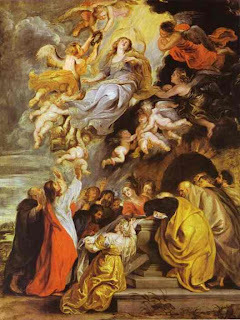 These entries can help us to grow in our love and devotion to Mary as we prepare to celebrate the Solemnity of the Assumption. 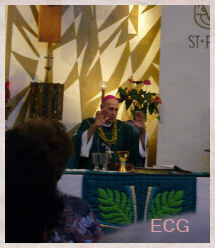 Click HERE top read the rest of Fr. Calloway's meditation. rejoin my soul in the unending bliss of heaven. you for help. I ask for this favor: (Mention your request). Your help would be greatly appreciated in spreading the word, contacting the appropriate persons at the parish and diocesan level to alert them to this anniversary, fostering the publication of articles on the topic for various periodicals, encouraging local women to gather and discuss the theme in various settings, and to pray for the message in Mulieris Dignitatem to be studied and lived. This is also a marvelous opportunity to reach out to women of good will in other denominations and faiths, inviting them to prayerfully consider its themes and to see if common ground could be found. We invite qualified speakers to submit a request, and thereby add their names to the site. Similarly, relevant books and organizations are welcome to provide their links. The timeliness of this observance cannot be overestimated. With debates raging over the nature of marriage, the sanctity of human life, the needs of children, and how the gifts of women are best promoted, what better way to form ourselves than by returning to the foundational questions of who women are and why the divine plan hinges on their cooperation. Kindly help us share this good news with as many as you can and please pray with us for a fruitful observance. Any questions, suggestions, or submissions of resources should be sent to gskineke at] feminine-genius.com. May Our Lady, in whose fidelity the entire world rejoices, bless this coming year and all our efforts to understand the richness of the feminine vocation. Oh where do I begin? 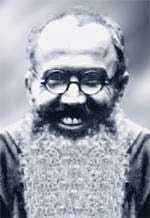 There is so much I want to share about St. Maximilian Kolbe with you. 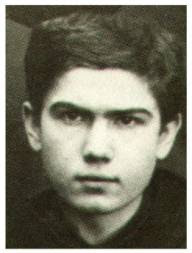 By now most of us know that Maximilian Kolbe was a Polish priest, a Franciscan. He was imprisoned in Auschwitz one of the notorious Nazi death camps and ultimately gave his life to save the life of a fellow prisoner. 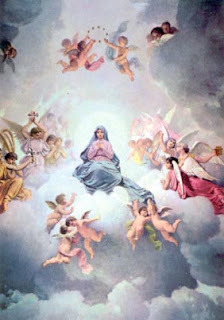 Note: With his love and devotion to our blessed Mother it is of no surprise that God chose to take him on the vigil of the Feast day of the Assumption of the Blessed Mother. 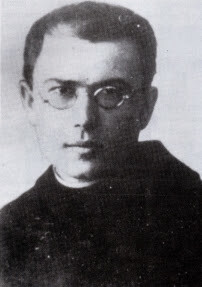 "Francis Gajowniczek, the man for whom Maximilian Kolbe gave his life, survived the war and was present at the 1971 beatification (blessing) ceremony of Father Kolbe. 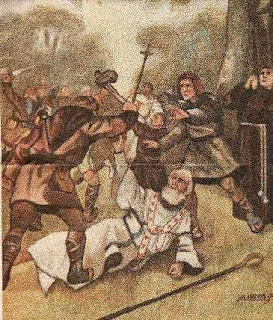 Gajowniczek died in 1995". A most amazing story that not only reveals the life of a Saint - but the last days of none other than Auschwitz Kommandant Rudolph Hoess. As a dual biography of a great saint and of one of the greatest criminals ever to scourge mankind, this book accomplishes what separate biographies of the two men could only suggest. 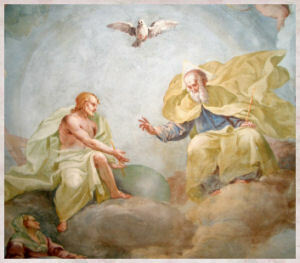 It shows the inevitable deadly collision of the two worlds that each represented, a collision that also produced unexpected atonement, conversion and healing. In the process, this double biography reveals mankind's last real hope for deliverance from the crazed, satanic forces that still afflict it. 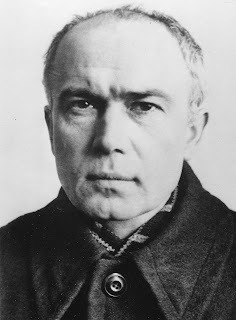 Rarely has the conflict of the two opposing worlds been so dramatized and epitomized as in the stories of Maximilian Kolbe and Rudolph Hoess. What elevates the story of Kolbe and Hoess to the level of an epic, is that both men were strikingly alike in their early lives and ideals. Both later became leaders who radically changed the lives of countless millions of people. For most of us, it is hard to appreciate and believe that tremendous power of Kolbe's faith, love and life until precisely we see something of the "inconceivable darkness" that they overcame. 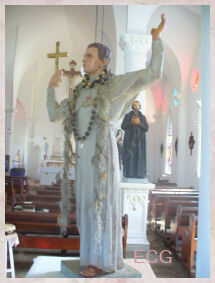 There is so much more to know about this amazing saint. 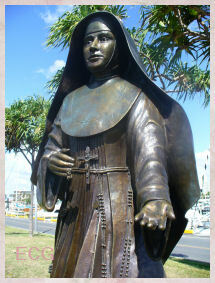 One of the things that was of interest to our family because of Joey's nationality, is that Fr. Kolbe went to Japan to bring Christianity to the Japanese people. 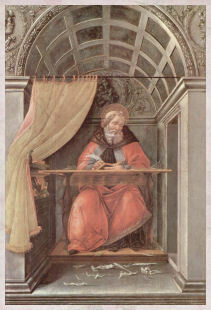 He also started a magazine and organization (really soldiers dedicated to Mary Immaculate) in honor of the Blessed Mother, to whom he had a great devotion. That organization is the Militia Immaculata is not only still in existence but is currently flourishing. As I have mentioned on many occasions, our family has been a member of the Militia Immaculata for many years now. 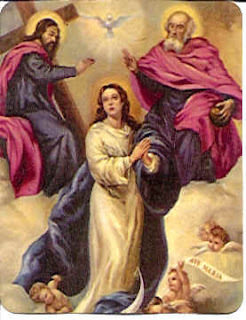 I hope you considering enrolling and consecrating yourselves and your family to Mary Immaculate through the Militia Immaculata. If it pleases you, use all that I am and have without reserve, wholly to accomplish what was said of you: "She will crush your head," and "You alone have destroyed all heresies in the whole world." 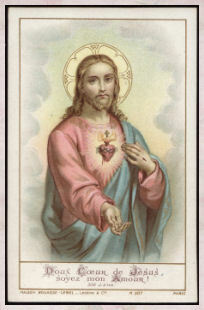 Let me be a fit instrument in your immaculate and merciful hands for introducing and increasing your glory to the maximum in all the many strayed and indifferent souls, and thus help extend as far as possible the blessed kingdom of the most Sacred Heart of Jesus. For wherever you enter you obtain the grace of conversion and growth in holiness, since it is through your hands that all graces come to us from the most Sacred Heart of Jesus. BTW, did you know that St. Maximilian also had a devotion to the Divine Mercy? That is why he along with St. Faustina and John Paul II are always mentioned by our family's in a little litany at the end of the Divine Mercy Chaplet. And lastly, a very happy 11th birthday to my nephew Carlos, who was blessed to be born on this great saint's feast day. 5. Forgive all injuries and offenses for in proportion, as we forgive others, God forgives us. Go to confession. This sacrament does more than “just” rid us of our sins; it gives us a tremendous increase in sanctifying grace. It wins for us a higher place in Heaven, with increased union with God. Each time we go to confession, we are preserved from many dangers and misfortunes which might otherwise have befallen us. A devout confession helps us to hear the inspirations of the Holy Spirit, and to hear and follow the advice of our guardian angels. 6. Avoid mortal sins, deliberate venial sins and break off bad habits. Then it will be relatively easy to satisfy God’s justice for sins of frailty. Above all avoid sins against charity and chastity in thought, word and deed for these sins are the reason why many souls are detained in Purgatory for a long time. 7. If afraid of doing too much work, do many little things, acts of kindness and charity, give the alms you can, don’t grumble or complain when things are not as you please, don’t complain of others, never refuse to do a favor for others when possible. These and such acts are a splendid penance. 8. 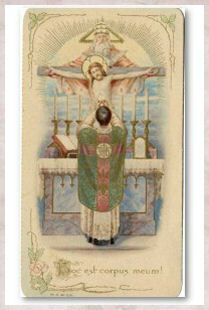 Do all in your power for the Holy Souls in Purgatory. Pray for them constantly, get others to do so, join the Friends of the Poor Souls and ask all those you know to do likewise. The Holy Souls will repay you most generously. 9. 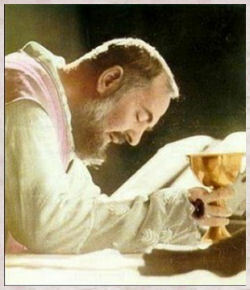 There is no more powerful way of obtaining from God a most holy and happy death than by weekly confession, daily Mass and daily communion. Masses may be arranged after or before someone’s death to expedite their time in Purgatory. 10. 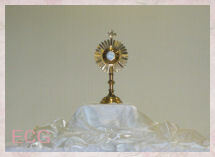 A daily visit to the Blessed Sacrament – if only for three or four minutes – is an easy way of obtaining the same grace. Kneel in the presence of Jesus with eyes fixed on the Tabernacle or Monstrance, sure that He is looking at you, then repeat little prayers like these: My Jesus, Mercy. My Jesus, have pity on me a sinner. My Jesus, I love you. My Jesus, give me a happy death. 11. Enroll in and wear the Brown Scapular of Our Lady of Mount Carmel. “Whosoever dies clothed in this scapular shall not suffer eternal fire.” This is the Blessed Virgin Mary’s Promise, made July 16, 1251 to St. Simon Stock. 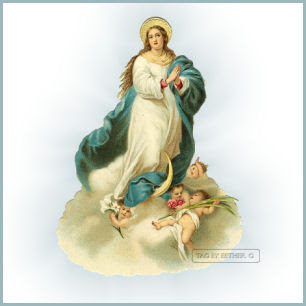 The Sabbatine Privilege is Mary’s promise to release from Purgatory soon after death all those who: 1) wear the brown scapular 2) observe chastity according to their state in life and 3) say the Little Office of the Blessed Virgin Mary every day. 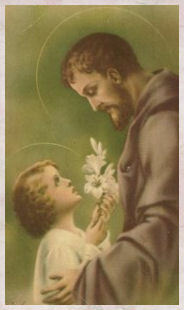 To be eligible for this scapular promise, one must be enrolled in the Family of Carmel. This is a simple ceremony which takes only a moment and may be done by any Carmelite or duly authorized priest. Mary’s motherhood is not limited to Catholics. It is extended to all men. Many miracles of conversion have been wrought in favor of non-Catholics who have practiced the scapular devotion. 12. Use holy water. Holy water is a sacramental that remits venial sin. Because of the blessing attached to it, Holy Church strongly encourages its use upon her children especially when danger threatens such as fire, storms, sickness and other calamities. Every Catholic home should have a supply of holy water. Keep your soul beautifully pure in God’s sight by making the Sign of the Cross carefully while saying: “By this holy water and by Thy Precious Blood, wash away all my sins and the sins of the Poor Souls in Purgatory, O Lord”. Thank you Sue for bringing this particular post to my attention. I may have posted it already previously, but even so, it's a good reminder. 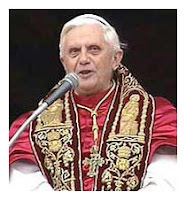 Jesus Christ, a King of Glory, has come in peace. May Christ protect us from all storms and lightning. Christ went through their midst in peace and the word was made flesh. Christ is with us with Mary. Flee, you enemy spirits, because the Lion of the Generation of Judah, the Root of David, has won. Holy God. Holy Powerful God. Holy Immortal God. Have mercy on us. Amen. The following is from TFP Rosary Campaign and shared by Sue Cifelli. It's not too late to plan a public square Rosary on October 13th...The 90th Anniversary of Fatima. 1. A special occasion: It is always good to pray the Rosary at home or in Church. But the 90 year anniversary of Fatima is an extraordinary feast day. The Public Square Rosary is a special celebration, a historic moment to proclaim the message of Fatima and honor Our Lady. 2. The Miracle of the Sun was public: On October 13, 1917, Our Lady performed a miracle witnessed by 70,000 people, including atheists, communists and anti-Catholics. Some of them converted. The Public Square Rosary Rallies will remind the man on the street in 2007 that conversion is possible. 3. Reach fallen away Catholics: According to research, only 28% of Catholics go to Church in America.1 The Public Square Rosary is a great way to reach the 72% non-practicing Catholics – 46 million people. If they see you praying in the street, they will be inclined to learn more about their faith. 5. 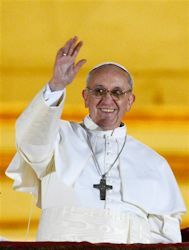 Be a Fatima apostle: Our Lord sent the apostles forth to teach all nations. Praying the Rosary in public is an excellent way to introduce others to the Catholic faith and the Fatima message. “Now no man lighting a candle covereth it with a vessel, or putteth it under a bed; but setteth it upon a candlestick, that they who come in may see the light” (St. Luke 8:16). 7. Will the media promote Fatima? Never. It’s up to us to promote devotion to Mary “outside the choir.” To pray the Rosary in the public square is a powerful way to promote its recitation. Catholics must not be ashamed of their Faith. “Every one therefore that shall confess me before men, I will also confess him before my Father Who is in heaven” (St. Matthew 10:32). During public Rosary rallies already held, non-Catholics have stopped and asked for Rosaries, wanting to learn how to pray. 8. Public Rosaries in history: At the end of World War II, Communist Soviet troops occupied Vienna, Austria. They refused to leave. Yet, after massive public Rosary processions led by Fr. Petrus Pavlicek, the Communist invaders packed up and left. Large-scale public Rosaries were likewise credited for foiling a Communist takeover in Brazil in 1964. If the Rosary saved these countries, it can save America. 9. Duty to honor God publicly: Secularists attempt to drive religion and morality out of the public square. 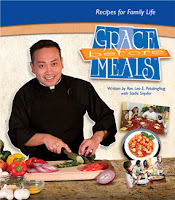 Children in public schools are suspended, for example, when they pray grace before meals. That cannot continue! Catholics have the duty to oppose the secularist agenda. We openly honor God and respect His Rights. 2,000 Public Square Rosary Rallies will make the point. 10. 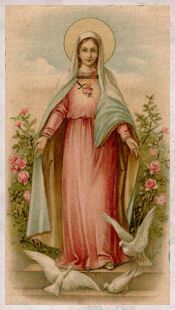 Preparing for Our Lady’s triumph: The Immaculate Heart of Mary will triumph over evil. It is a great privilege to be among those who trust in her triumph and honor her in the public square. Imagine 2,000 Public Square Rosary Rallies. This historic campaign will hasten God’s victory, attract blessings on America, and surely strengthen every Rosary Captain and every rally participant. To get more information on the Public Square Rosary Campaign, call 1-866-584-6012.